Delhi breathed poison today with pollutants touching calamitous levels, as a thick grey smog hung low across the region, prompting authorities to declare schools shut till Sunday. 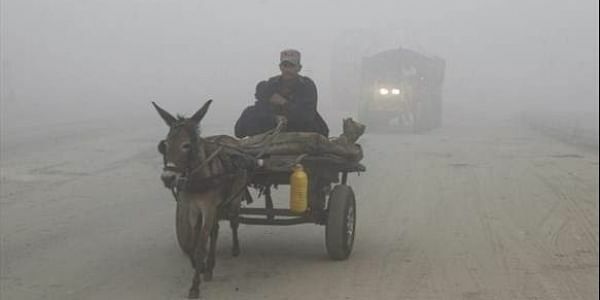 NEW DELHI: Delhi breathed poison today with pollutants touching calamitous levels, as a thick grey smog hung low across the region, prompting authorities to declare schools shut till Sunday, halt construction activities and ban entry of trucks in the city. Lt Governor Anil Baijal approved the Environment Pollution (Prevention and Control) Authority's decision to enforce these measures enlisted under the 'severe plus' or emergency category of the Graded Response Action Plan (GRAP) in a meeting attended by Chief Minister Arvind Kejriwal. A decision on whether or not to implement the odd-even car-rationing scheme will be taken tomorrow, the EPCA said. "The Central Pollution Control Board (CPCB) task force has advised EPCA that given the prevailing air pollution emergency in the city, there is a need to take actions which are listed in the severe plus category," it said. Authorities in the city scrambled to tackle the extraordinary situation as hospitals recorded a surge in the number of patients complaining of respiratory problems, reminiscent of the '1952 Great Smog of London'. After Diwali last year, Delhi witnessed a similar episode of smog which lasted nearly a week, prompting authorities to declare such emergency measures for the first time in the city's history. The smog, which triggered near zero visibility at many places, pile-ups on highways and delay in flight operations, is a mixture of carbon monoxide, particulate matter such as PM2.5, PM10, ground level ozone and oxides of nitrogen and sulphur dioxide, the Delhi government said in a health advisory. The government also announced that all schools in the national capital would remain closed till Sunday in view of the "unbearable" air pollution. On Twitter, Chief Minister Arvind Kejriwal said it was "an emergency" and that his office was "continuously trying" to fix a meeting with his counterparts in Punjab and Haryana on stubble burning, a practice which aggravates air pollution in Delhi. However, EPCA member Sunita Narain cautioned against putting too much hope in temporary solutions such as closure of schools and deplored the "lack of political will" in executing tougher decisions. Subsequently, the LG directed that agencies such as the municipal corporations and the Delhi Metro should strictly enforce the decisions taken by the EPCA, including hiking parking fares by four times. The civic bodies were dilly-dallying in executing the EPCA's orders. However, it was decided that metro will not have to slash commuting fares temporarily as it already has a differential pricing system for peak and off-peak hours in place. In its health advisory, the government said people should stay indoors as much as possible as the "smog is poisonous" and may create many health hazards like asthma attacks and other breathing complications. The day-long average air quality index of the Central Pollution Control Board (CPCB) had a score of 478 on a scale of 500, indicating 'severe' levels of pollution, while many individual stations recorded AQI as high as 487. If the score touches 500 and persists there for at least 48 hours, measures like odd-even and a ban on construction and demolition activities will come into force across the Delhi- NCR under the Graded Response Action Plan (GRAP). Transport Minister Kailash Gahlot told PTI that the government was ready to implement the odd-even car-rationing scheme and arrangements were underway to press more buses into service. "We will enforce odd-even in Delhi if air quality turns severe plus. I have also directed DTC to procure 500 buses on short-term basis to augment public transport till March. Metro has also been asked to hire around 300 buses for 15-20 days if odd-even is implemented," Gahlot said, adding that two- wheelers will be exempted from the scheme as and when it is rolled out. The Delhi Metro Rail Corporation Limited (DMRC) said it would run an additional 186 train trips from tomorrow. "Cities and administrations need to implement solutions and take bold decisions to reduce emissions. The range of actions recommended and directed by the EPCA is targeted at doing just that, and it is now up to the political leadership of Delhi and NCR to take their implementation forward," Narain, who is also the chief of the Centre For Science and Environment (CSE), said. The EPCA had made it clear yesterday that its orders were legally binding and had to be enforced once the chief secretaries of the respective states issue them. It was the Environment Ministry which, in January, had empowered the EPCA through a gazette notification to enforce the GRAP to combat air pollution in the Delhi-NCR region. Meanwhile, in incidents of pile-ups at multiple locations on the busy Yamuna Expressway over 20 vehicles collided and around 22 people suffered minor injuries during the morning hours when visibility was a measly 10 metres. For the second day in a row, operations at the Delhi airport were hampered and there were delays of up to two hours. Airport sources said that there were times when only one runway was operable as visibility dropped in the afternoon. According to the forecast of the Union Ministry of Earth Sciences' System of Air Quality and Weather Forecasting And Research (SAFAR), the 24-hour-average concentrations of PM2.5 and PM10 will be around 420 and 678 micrograms per cubic metre. The secretary of the Ministry of Earth Sciences, Madhavan Rajeevan, said the smog in Delhi is not localised, but spread across the entire region. He said the conditions would persist for another two-three days. The SAFAR suggested that the "sudden" intrusion of pollutant-laden smoke from neighbouring Punjab and Haryana from the night of November 6 led to the spike as the high quantity of moisture in the city's air trapped the particulates. "There is absolutely no wind movement. Moreover, temperature is also not coming down substantially which could have resulted in the conversion of the fog into water and subsequent dispersion of the suspended particulates," CPCB scientist Dipankar Saha explained. Apart from Delhi, neighbouring Faridabad, Ghaziabad, Gurgaon and Noida were also in the 'severe' category. Residents of the city complained of heavy breathing and watery eyes as the smog did not even spare living rooms or underground metro stations. In London smog of 1952 about 4,000 people had died prematurely when average PM levels were about 500 micrograms per cubic metre along with high SO2 levels. Yesterday, with a score of 448 in a scale of 500, the air quality index was at the year's worst. The Indian Medical Association had declared a "public health emergency" and appealed to the government to stop outdoor sports and other such activities in schools to protect the health of children.